DELIGHTING IN HIM: What to Study? This picture is of Danielle in the gallery she has had the opportunity to help create. 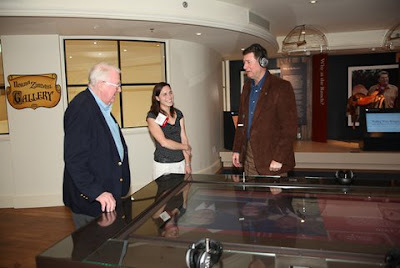 She is standing in front of the interactive timeline table with Governor George Allen and Attorney General Edwin Meese. I post this mostly for those of you who are seeking to direct older children in their education. Danielle has always loved history, she has read biographies, historical fiction and non-fiction histories since she could independently read! When she first starting thinking about colleges and careers she tried to pigeon hole herself into and education that would provide a job and give an easy answer to all those asking what she was going to do. In high school she wrote a paper on being a dietitian and did interviews, I can remember when she got done she was very sure she did not want to do that. When she started college, she decided on teaching, so she could study history with a career in mind. After a few teaching classes and an in-class practicum she knew teaching high school and below was not for her! I remember very distinctly the day she called and said what am I supposed to do? We talked and discussed the issues--her way of making decisions. And I finally just said, "What do you want to study more than anything?" Without a hesitation she said, "History!" When you took out everything else, her love was history was the answer. Funny that it is what she always has loved! So the question was, "Danielle, do you trust God enough to follow your heart and trust Him with the results (job)?" The rest is history--pun intended! We had many people question why Danielle was studying history, what would she do with that kind of degree. Danielle chose to walk in faith, study what she loved and trust God to lead in how she would use that education. Danielle was one of only two in her college graduating class that had a job lined up on graduation day. God does go before us! She has been blessed with a job that allows her to live daily studying history!! She is involved in teaching all ages how this history impacts our lives even today. And she loves it! Now we watch Erinn traverse the same road!! She has always loved studying history and different cultures. Anthropology? What do you do with that degree? At this point Erinn has no idea what the road holds two years from now upon graduation, but let me tell you we are excited to find out what God has in store as she walks this road of faith!! Anyways I just wanted to encourage you to find what your kids love and help them develop that love and watch the Lord lead!